It doesn’t take much to be faced with a major meltdown mid-shopping trip, complete with a screaming, crying blob of a child sprawled across the floor. Perhaps it was because your child spied a colourful toy, wanted the cereal with the cartoon character that you’ve banned, or was fed up with being strapped down in a cart or stroller. Whether you’re grocery shopping or buying gifts, you’ll want to keep these 5 secrets to shopping with a child in mind to save your sanity and avoid a messy scene during your next shopping trip. 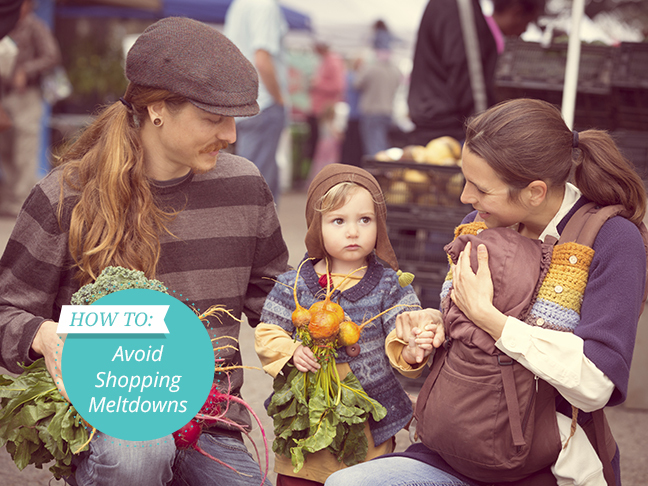 Try to plan your shopping trips at the optimal time for your kids. You’ll want to make sure they are well rested, tummies are full and that they feel well. In addition, shopping during times when it’s less crowded – weeknights and when stores first open on the weekends – will help avoid long lines and unnecessary delays when your child is at the breaking point. 2. Break Out the Entertainment. Be sure to bring things to occupy your children’s attention. When you notice that your kids are no longer amused by the shopping trip itself, it’s time to unveil those items. “Does your daughter need her teddy bear to comfort her during a long shopping trip? Can you put your son in the shopping cart with a good book so he can read or look at pictures while you shop?” are examples of things to consider says Candy Wingate, president of Nannies4Hire. Another secret to distracting your child is to bring a new or favourite snack along for him/her to munch on. The classics include Cheerios, Goldfish, and fruit snacks. A shopping trick that Mandy uses when she gets desperate is dialing a friend. “When the ‘I wants’ get started, I simply dial my mum, give the phone to my oldest, plop him in the back of the cart and let Nana babysit for a half hour,” she says. While some parents cringe at the thought of offering rewards for good behaviour, most know it’s only a matter of time. The promise of a treat can go a long way toward giving you some extra shopping time. Rewards can include a new toy, colouring book, watching a favourite cartoon or listening to music, going to the park or library, or a special edible. However, if your child doesn’t carry through with his end of the deal (i.e. good behaviour during the shopping trip), then you have to be willing to deny you child the reward. This is one of the ways in which children learn that actions have consequences. If your children are small, place them in your shopping cart or stroller. If they are older and more responsible, ask them to help you shop for gifts. Children love to be helpers. “During the holidays you can teach them the spirit of giving by talking about the person you are shopping for, their likes and dislikes, and what’s appropriate for their age,” shares Candi. By enlisting them in the process of picking out items, you’re keeping them entertained and less likely to run off on some wild adventure of their own. 5. Engage a Young Mind. Try to turn the shopping experience into a game for your kids. You might have them take turns listing things they are grateful for, ask specific trivia questions about the holidays or an upcoming event, or grab two items from the store and ask them to name differences and similarities between the objects. Be sure to praise their efforts in responding and provide the correct answers if needed, advises Candi. Your interaction with your children will help keep them engaged and your shopping trip productive. Kristi Valentini does whatever it takes, a diet heavy on chocolate and caffeine, Gregorian chants, whatever, to maintain inner peace among motherhood, career and the pursuit of domestic glory. Like other mums today, she strives for balance but makes do with a multi-tasking juggling act. Kristi began her blog, Mummy Crib Notes, to give other mums a "cheat sheet" of discoveries, tips and gadgets that can make parenthood easier. When not changing nappys or playing dolls with her two little beauties, Kristi is a marketing communications strategist and a freelance writer. Find her at Mummy Crib Notes.